September 2009: Four September Superstars. Four Awesome Strategies. A core component of our work involves tracking and responding to the specific goals and challenges being tackled by the tutors, mentors, coaches and new teachers we serve. This month, we want to share three of the top ten challenges that tend to top the list every September, along with some of the strategies that individuals we serve created to address those issues. How can I get my students to not only set goals at the beginning of the school year, but to hold themselves accountable for accomplishing them? Check out Quilt of Goals by Girls For A Change coach and Network Superstar Angela Krumm. Help! My students won't focus during our sessions. Check out It Feels Good to Write (A Daily Activity to Achieve Focus) by America Reads - Mississippi AmeriCorps member and Network Superstar Taneisha Carter. Also, check out Two Simple Strategies to Help Students Stay Focused by City of Lakes AmeriCorps member and Network Superstar, Sarah Ihrcke. When I'm working with a group of students, what’s something I can try to make sure everybody participates during discussions? Check out Making Sure Everybody Has a Chance to Respond to Questions by ShoreCorps/PALS AmeriCorps member and Network Superstar, Jessica Christensen. Challenge #1: How can I get my students to not only set goals at the beginning of the school year, but to hold themselves accountable for accomplishing them? Situation: I strongly felt the girls were struggling to hold themselves and each other accountable for making changes in their lives. I heard them hint at goals without clearly articulating them or using action language to move forward on their goals. This activity allows them to state their goals and check in about them as a group. Step 1: Invited the girls to spend some time thinking about and writing down their personal goals for the current school year. I asked the girls to make sure that their goals were both "realistic" (e.g., Is that something you believe you can achieve? How committed are you to making those changes?) and "specific" (e.g., How many times per week will you practice that new skill? How many new words will you learn per day?"). Here's a goal-setting template that you can pass out to each girl (they'll use one sheet per goal). Let the girls know that they won't fill out the last section until the end ("Name and contact info of the person on my team who I’ll be checking in with and getting ideas and support from"). If you think it will be helpful, pair up the girls to give them time to share, discuss and refine their top one or two goals. Step 2: Asked the girls to use images and words to illustrate one of their most important goals on a small piece of colorful paper. Step 3: Each girl shared their goal with the group and asked the group to help them be accountable. As they shared their goals, we asked each girl questions about how their goal is "realistic" and "specific", using questions such as the ones noted in Step 1, and drawing on information they should have included on the goal-setting template. These questions will likely help each girl form a more concrete idea of her goal as well. Step 4: After each girl responded to the questions, she attached her goal goal to the butcher paper (making a "quilt of goals" for the team). After each girl presents her goal, or after the entire quilt is made, consider giving the girls an opportunity return to the goal setting template so that they can refine their goals and their plans to accomplish them. If possible, give the girls time to work one-on-one or in small groups to brainstorm with one another on how they can accomplish their goals. During that time, you may have your own one-on-one or small group meetings to make sure that the steps the girls are planning to work on are specific and realistic. Also consider pairing up the girls, and requiring each pair to check in with one another via phone or e-mail on their progress towards reaching their goals every week or every other week. The girls can schedule their check-in times during your session. Step 5: Every other meeting, we engage in a "goal-check-in", where each girl reminds the team of her goals and checks in about progress. If they are not making progress, the team asks the girl questions about what changes she might make in the coming week to work toward accomplishing the goal or revising the goal to be more realistic. Consider giving the girls a few minutes following these check-ins to either journal or update their goal setting templates. If you paired up the girls for outside-session check-ins, give them a minute to schedule their next check-in time. Challenge #2 (Part 1 of 2): Help! My students won’t focus during our sessions :-(. It Feels Good to Write! Situation: When I first started tutoring my students (most of whom have failed classes at least once), the students couldn't concentrate on the readings and lessons being taught because they were angry with someone or had a lot on their minds. I decided to create a daily practice for them in which they write out whatever is on their minds in the form of a short story before we begin our tutoring sessions. This practice gave my students an opportunity to vent and process their feelings. After they participate in the practice, they have a much easier time focusing on the skills and content we need to cover during our tutoring sessions. Step 1: First, the student chose two sheets of colored construction paper, tucked some typing paper in the middle, and stapled it to make a scrap book. Step 2: I let the students design the covers of their books to get their creative thought processes rolling. Step 3: After the students designed their covers, they wrote their first short story about what was going on in their lives at the time. The short story helps them express feelings and clear their minds of issues that may be bothering them. If students prefer to draw how they're feeling on some days, I give them the opportunity to do so. Let your students know that while you will be reading the stories to get a better understanding of how they're feeling and what's going on in their lives, you won't be grading or correcting their work. This is space for them to be creative and to turn what's going on in their own lives into stories. It's important that you read the stories in case something is going on in a student's life that needs to be addressed as soon as possible. Step 4: Everyday, the students come in the room, draw their feelings, and write a short story about what they are feeling. We have such an easier time focusing during our tutoring time now! If this strategy works for you, and if you’re an America Learns Network member, also check out The "Thought Lot" (Helping Students Deal with Daydreaming and Wandering Minds). Challenge #2 (Part 2 of 2): Help! My students won’t focus during our sessions :-(. Situation: I tutor a couple students who struggle with staying seated and engaged during tutoring sessions. They need to be constantly reminded to sit down, stop making noises, stay focused, etc. Strategy #1: When students have a problem sitting still, I let them work on the floor or work standing up. Strategy #2: Also, I have a small squishy ball that students can play with while they work. For some reason, doing something with their hands helps some students stay engaged and focused. Challenge #3: When I’m working with a group of students, what’s something I can try to make sure everybody participates during discussions? Situation: I found that if I asked a group of students a question without letting them know how I wanted them to respond, it created a problem. Some students would just shout out their answers while others would raise their hands to be called on to answer. This type of situation created poor group participation, lots of distractions and caused many students to be overlooked. Asking the group a question in this manner also made it hard to regain the group's attention and continue on with the discussion. What to do: If you ask a question when talking to group, first tell your students how you would like them to respond. - First tell the group: "Please raise your hand if you can tell me......."
- Then ask your question: "the difference between a reptile and an amphibian." - First tell the group: "Now go ahead and just shout out the answers......."
- Then ask your question: "Can anyone tell me what animals we talked about last month?" 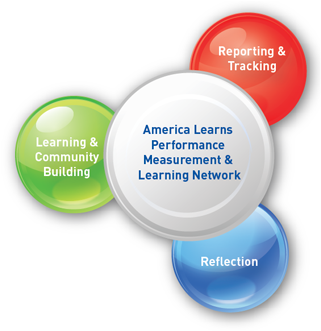 All of the strategies we celebrate here have been contributed by tutors, mentors, coaches or new teachers who are using the America Learns Performance Measurement & Learning Network. The educators and mentors we serve use the Network to to report their progress, reflect on their recent sessions, plan for their upcoming sessions, participate in an incredible learning community of individuals within their organizations and around the world, and receive weekly, personalized coaching and support to ensure that they are accomplishing their goals and the goals of the students or mentees they’re serving.